Rob Scuderi had a plus-three rating overall in Round One of 2008 Stanley Cup Playoffs, and in his last four games he has been even-or-better. St. Anthony's High School in South Huntington, N.Y., was named by Sports Illustrated two years ago as the top high school for sports in the state, based on their 18 league titles, plus several state championships, in the previous decade. According to SI, the Friars' most dominant programs were in football, lacrosse, track, cross country and girl's soccer. The football team, led by four league First Team All Stars, recently won its seventh consecutive title, despite having its 64-game winning streak snapped. Hammer thrower Walter Henning holds the national high-school record of 255 feet, 11 inches, more than 12 feet past the prior record. It's easy to find positive things on the Internet about St. Anthony's academics and athletics but if you go looking for stories about Rob Scuderi's exploits at the school, well, he's practically invisible. Except for his freshman year at Boston College and his two productive seasons playing for coach Henry Lazar in the Apple Core youth program, Rob Scuderi has always been nearly invisible and, as he says, for a defensive defenseman, that's a good thing. "I've had so many coaches come up to me and say that they really didn't notice me out there," Scuderi said. "I used to think I'd try to do something so they would notice me but they said no, that's good. Every defenseman can't be a highlight reel. Coaches tell me they need at least one or two guys playing quiet, steady defense. As long as that keeps working, I'll keep doing it." "Rob was a raw talent when he came to Apple Core in his junior year of high school," Lazar said. "He developed right away. I paired him with Kevin Mitchell, who went on to a nice junior career with Guelph. They had good chemistry and got better and better. "The year we won the nationals, we played 32 games in the Met League and gave up only 40 goals. Rob and Kevin were on the ice for only 10 goals-against all season. Rob dominated the next year as a senior and again kept getting better and better. He went off to Boston College and did very well for them. "Rob works hard and there's no nonsense. He was always a very mature player and nothing bothered him. He is able to handle all adversity and pressure and his game never deviates. It's impossible to get by him one-on-one. He can do some offensive things but he saw he could be more valuable as a defensive defenseman. "Coaches need guys like that, guys you can trust with a minute left in the game. Guys who get the job done. Rob's that kind of player." Scuderi has quietly worked his way into a top role with the Pittsburgh Penguins and coach Michel Therrien likes the steady way Scuderi handles his job. Scuderi is averaging 17:32 per game in the playoffs. "He has an important role. He's earned the respect of his peers in this dressing room because he is a good stay-at-home defenseman," Therrien said. "He has a good stick. Fans won't notice Rob Scuderi on the ice that much, but he's good defensively, never out of position and he makes a good first pass. "I coached him in the minors at Wilkes-Barre (AHL) and I've always been really pleased with the way he approaches a game. You always know what you are going to get from Rob, game in and game out. He very rarely has a bad game. He's very consistent." Scuderi, 29, is a native of Syosset, N.Y., and one of two Penguins' defensemen produced by the widely respected Apple Core Tier II Youth and Junior College Development Organization, along with Mark Eaton. Scuderi played two seasons for Apple Core and credited well-known coach Henry Lazar for helping shape his game. Belying his reputation as a defensive defenseman, Scuderi had 42 goals and 70 assists for 112 points in 82 games in his second year with Apple Core. Scuderi then spent four seasons at Boston College and was a key member of the 2001 NCAA championship team. "Henry Lazar was my coach at Apple Core. He taught me a lot about the game," Scuderi said. "Then at college, Jerry York and his assistants, Mike Cavanaugh, Jim Logue and Scott Paluch (now head coach at Bowling Green). They were all very knowledgable about the game. I was very fortunate, along the way, to have coaches that gave me that knowledge." Scuderi fit into his current mold at Boston College, putting up seven goals and 63 assists in four seasons. He had zero goals and 24 assists as a freshman for the Eagles and was named to the Hockey East All Rookie Team. Scuderi was taken in the fifth round, 134th overall, by the Penguins in the 1998 Entry Draft. Scuderi had a knack for big plays at important times, including an assist in the Eagles' 1999 Hockey East championship game against New Hampshire and current teammate, goalie Ty Conklin. As a junior, he had the assist that helped the Eagles beat Wisconsin in the NCAA tournament. In 2001, he had the winning goal against Boston University to capture the Beanpot Tournament. Scuderi also scored a memorable power-play goal that helped eliminate Maine in the NCAA quarterfinal game. He was later named to the 2001 NCAA All Tournament Team. In fact, Scuderi and his teammates from the 2001 graduation class, Brian Gionta, Bobby Allen, Mike Lephart, Marty Hughes, Scott Clemmensen, Mark McLennan and Dan Sullivan, qualified for the Frozen Four in four-straight seasons and played in three championship games. Despite his college heroics, Scuderi spent over four seasons honing his skills with Wilkes-Barre in the American Hockey League, where he came under Therrien's tutelage. 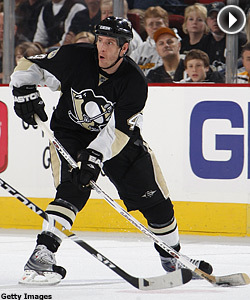 He played 13 games with Pittsburgh in 2003-04 and is in his third full season with the Penguins. He still feels like he's learning the game. "It's always ongoing. Every year, I've just tried to get a little bit better," Scuderi said. "I'm never going to make the plays that Ryan Whitney and Brooks Orpik make. Brooks is a great hitter. Ryan is incredibly gifted. I'm never going to have either one of those things. I try to get by on my smarts and anticipation. It's important to me to keep developing and I think I've done that so far."